Because of changing social and economic conditions, the skills a community college president needs today are substantially different than those needed just 10 years ago. Plus, half of North Carolina’s 58 community college presidents are expected to retire by 2019. To address these challenges, the NC State College of Education has transformed the way it supports the North Carolina Community College System. Decades ago a high school diploma was good enough to get a job that paid wages to support a family in North Carolina. Not so today, when 65 percent of newly created jobs in the state require more than a diploma, but not necessarily a four-year degree. With such changing economic and social conditions, the skills required of community college presidents today are substantially different than those required even 10 years ago, says Bob Templin, Professor of the Practice in the NC State College of Education and a Senior Fellow with the Aspen Institute College Excellence Program. Community college leaders today must leverage fewer dollars and resources, ensure access for nontraditional and underrepresented students, and maintain enrollments, he says. They also must find better ways of reaching students to ensure completion and strong postgraduate outcomes – as measured by the students’ ability to secure well-paying jobs or transfer to a four-year institution. Having a capable leader at these “gateway institutions” is paramount to achieve that level of student success, says Pamela Senegal ’11 EDD, President of Piedmont Community College. Heeding the call, the NC State College of Education has transformed the way it prepares community college presidents and supports the North Carolina Community College System. Simultaneously, the college is creating a pipeline of community college leaders that will help address another challenge: Half of the state’s 58 community colleges presidents are expected to step down by 2019. “We are reaching a point where presidential change is occurring nationally at the rate of about one per day, and it’s likely to be this way – although maybe not at the exact same rate – for the next 10 years,” says Templin. Half of the state’s 58 community colleges presidents are expected to step down by 2019. For years the college’s Doctor of Education program designed for community college leaders was more focused on traditional research, says Audrey Jaeger, Ph.D., Professor of Higher Education and Alumni Distinguished Graduate Professor at NC State. “And traditional research is important,” she says. So in 2015 the college started the Envisioning Excellence for Community College Leadership Program, which the John M. Belk Endowment funded and for which Jaeger, Dean Mary Ann Danowitz and Associate Professor James Bartlett serve as the principal investigators. The Aspen Institute is a nonpartisan forum for values-based leadership and the exchange of ideas that has developed a practice-oriented curriculum in community college leadership following extensive research of the most effective community colleges. NC State’s Envisioning Excellence for Community College Leadership Program has partnered with the institute to create a degree program exclusively targeting students who aspire to executive positions within community colleges. 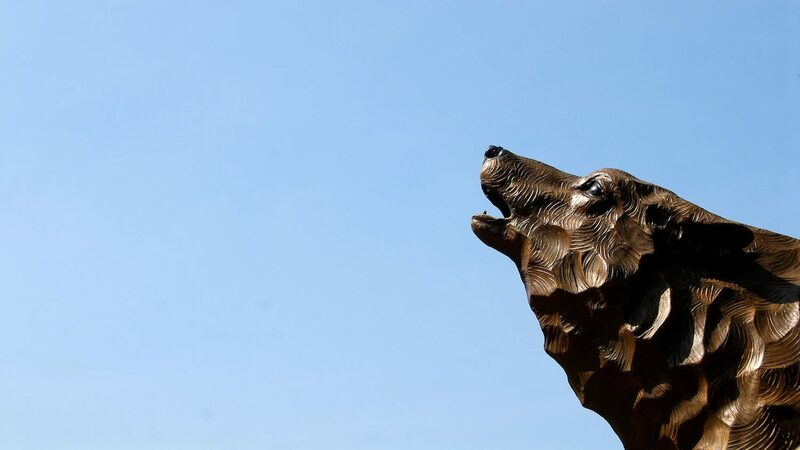 NC State is the first to adopt the Aspen Institute’s framework, which emphasizes equity, completion, learning and labor market outcomes and how those factors impact the presidency. Envisioning Excellence for Community College Leadership is leading NC State’s efforts to expand professional development opportunities and create a statewide resource network for community college leaders.The program has also overseen a total renovation of the Doctor of Education (Ed.D.) for community college executives. Envisioning Excellence partnered with the Aspen Institute to create a degree program exclusively targeting students who aspire to executive positions within community colleges. Aspen has recently developed a practice-oriented curriculum in leadership following its extensive research on the nation’s top-performing community colleges. NC State is the first institution to adopt Aspen’s framework, which emphasizes equity, completion, learning and labor market outcomes and how those factors impact the presidency. The three-and-a-half year, cohort-based program is housed in Charlotte and Raleigh, and many courses are co-taught by NC State faculty and sitting community college presidents, creating a program that blends theory, research and best practices. Insider Higher Ed has described the revamped doctoral program one of the “most innovative” in the country. The current 82 doctoral students are primarily comprised of community college practitioners, who take courses on set weekends and are able to start dissertation work alongside their coursework from the beginning. That not only pushes them toward graduation but allows them to apply new knowledge directly to their jobs each day. Today, 13 NC State graduates serve as presidents of community colleges in North Carolina. Envisioning Excellence aims to have half of its graduates take the top post during their careers. But the long-term goal runs deeper than that, Jaeger says. “The tangible outcome [of Envisioning Excellence’s efforts] will eventually be not only how many graduates end up in the presidency post-NC State, but also what it is that they’re doing for their institutions and their students,” she says. Three priorities drive NC State's Envisioning Excellence for Community College Leadership Program. In addition to the revamped Ed.D. program, the NC State College of Education offers professional development programs for current practitioners in top and mid-level positions at community colleges throughout North Carolina. 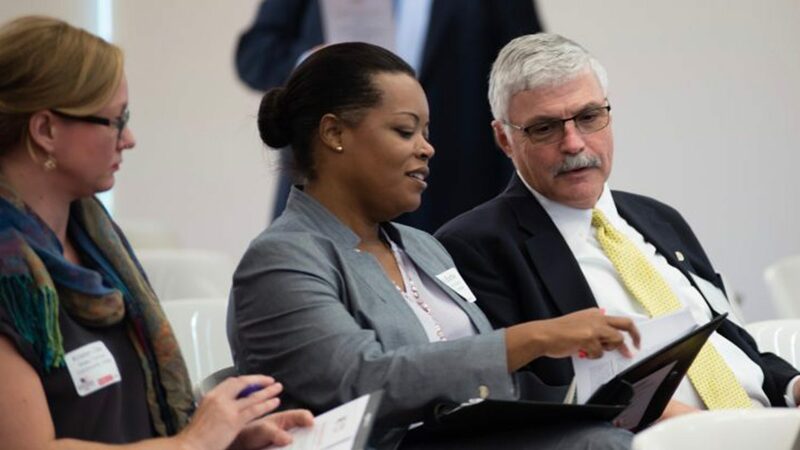 Those programs include the Department Chairs Institute, a three-day annual leadership retreat for community college leaders taught by a mix of national and state practitioners and research experts. Since its inception in 2004, the Department Chairs Institute has gone from serving about 30 people per year to several hundred community college constituents at entry, mid and senior level leadership positions from nearly all of North Carolina’s community colleges. Topics for each institute are selected based on needs identified through meetings with an advisory board from the state community college system and data collected from assessment surveys and focus groups. 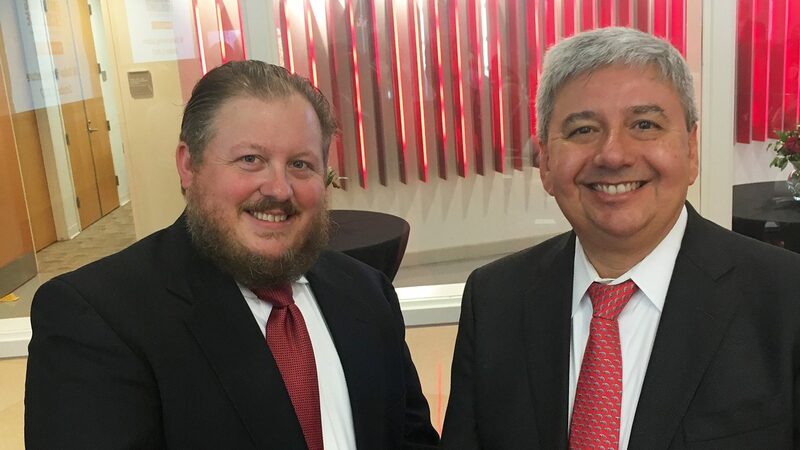 The College of Education has received a planning grant to develop two additional arms to support community college leaders at all levels through Envisioning Excellence for Community College Leadership: a Presidents’ Academy and a Trustees Institute. The President’s Academy will help community college presidents strengthen their institution’s performance through emphasizing post-completion outcomes as the measure of student success. The Trustee Institute will emphasize supporting executive efforts around post-completion outcomes while also reviewing key duties and responsibilities. The planning grant will also help NC State develop the capacity to make research readily available to executive leaders to inform their decision making. What can higher education leaders do to address economic inequality and declining social mobility? 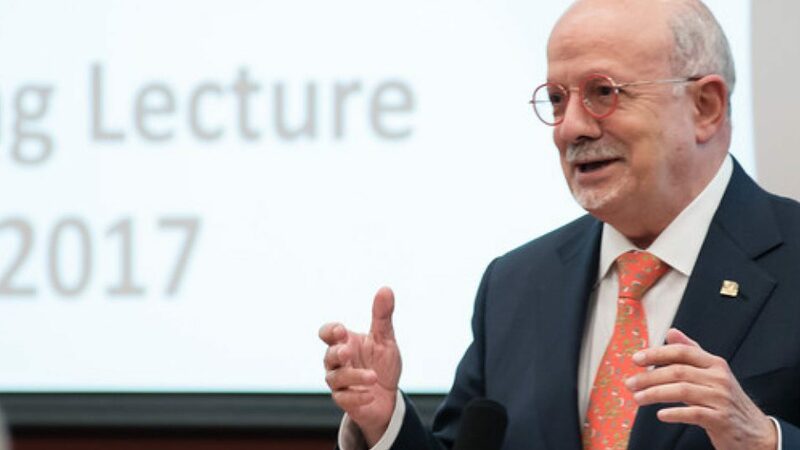 Miami Dade College President Eduardo Padrón offered five ways in the 2017 Dallas Herring Lecture he delivered in October, including reclaiming the meaning of prestige and reclaiming vocational education. The NC State College of Education and Envisioning Excellence for Community College Leadership Program hosts the annual lecture as part of its efforts to support community college and higher education leaders. Envisioning Excellence launched the Community College Leadership Blog in March 2017. The blog is an online resource where students and practitioners can read articles on topics specifically related to community colleges from state and national contributors. Daniel J. Phelan, the president/CEO of Jackson College in Jackson, Mississippi, and former chair of the AACC Board of Directors, recently wrote an entry about three factors of success for community college leaders: culture, governance and personal responsibility. Not even 8 months old, the Community College Leadership Blog already has over 1,400 subscribers. The annual Dallas Herring Lecture has also been transformed. Previously, the event was faculty-centric and largely served an internal audience. Today, the lecture draws together some of the nation’s most dynamic voices in higher education. This past October, Eduardo J. Padrón delivered the lecture. He is the president of Miami Dade College, the nation’s largest institution of higher education, and a recipient of the 2016 Presidential Medal of Freedom from President Obama. “Will we be an engine of inequality or the best hope of people trying to build lives in this new America?” Padrón asked the 125-plus Dallas Herring Lecture attendees that included community college leaders from across North Carolina. Through the leaders it prepares and supports, the NC State College of Education works to be the latter. Through the development of the Executive Mentorship Program, NC State’s Adult and Community College Doctorate of Education program is exposing its students to leadership in action and preparing them for mid-level and senior leadership positions upon graduation. In this Q&A, NC Community College President of the Year Stelfanie Williams ’11 EdD discusses her recent honor, why she chose education as a career, and how Vance-Granville Community College is impacting North Carolina.